I love rib tips and make them as an appetizer often. I had guests coming over, I had rib trimmings and I had my favourite barbecue sauce, Koss Sauce. Everything was coming together. One of the reasons I like making rib tips for company is I can do most of the work before the day company is coming and then just finish them on the day of the visit. You can use any barbecue sauce you like. I just find that Koss Sauce is a little less sweet and gives a great tangy balance when used as a gaze on the ribs. I started with a little over 2 pounds of rib trimmings from making St Louis Ribs. I cut them into 1 to 1 1/2 inch squares. I sprinkled them generously with my Basic BBQ Rub. You can use any barbecue rub you like. I preheated my smoker to 230 F and put the ribs on for 3 hours. I brought the ribs in and put them in a roasting pan. I added 250 ml (1 cup) of apple juice and covered the pan with foil. As the pan is foiled, the meat will not take any more smoke. So, you can put it back in the 230 F smoker or in a 230 F oven without any difference in flavour. Cook at 230 F for 2 hours. At this point you have a choice. You can go ahead and finish the rib tips or you can cool them to room temperature to finish the next day. You can even freeze them for use at a future time. If the rib tips have been frozen, thaw them before finishing. 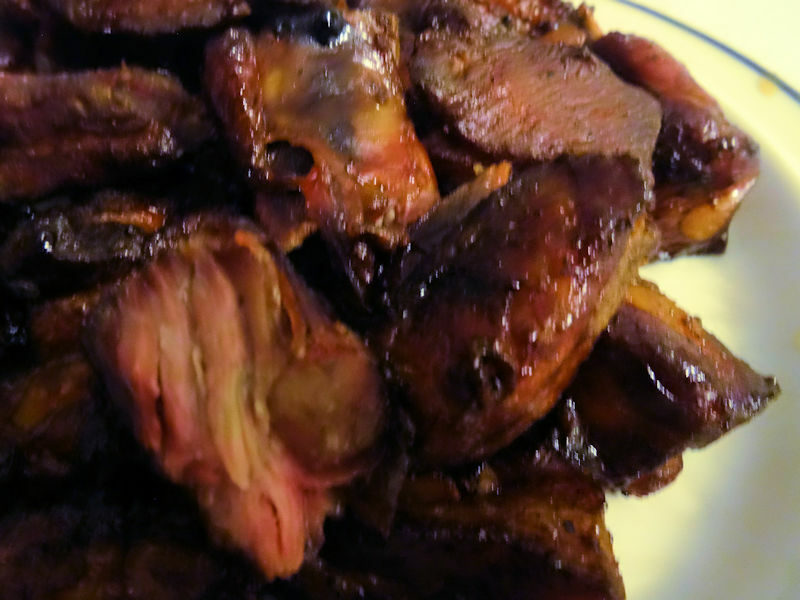 Put the rib tips in a roasting pan and brush them with the Koss sauce. Put them in a 230 F oven or smoker and cook for 30 minutes. Brush again with the Koss Sauce and cook for another 30 minutes. If you had left the ribs to cool to room temperature before finishing, add 15 minutes to these cooking times. These are so good. The fat mostly rends out leaving incredibly tender pork on easily removed bones and cartilage. The Koss Sauce gives a nice sweet glaze with tang and a touch of heat. These vanished soon after the guests arrived! Cut rib trimmings into 1 to 1 1/2 squares. Sprinkle barbecue rub over rib tips. Smoke at 230 F for 3 hours. You can also cook in a 230 F oven for 3 hours but it won't have smoke flavour. Put the rib tips in a roasting pan. Add the apple juice. Cover with foil and cook at 230 F for 2 hours. At this point, you can either finish the rib tips or let them cool to room temperature to finish the next day. 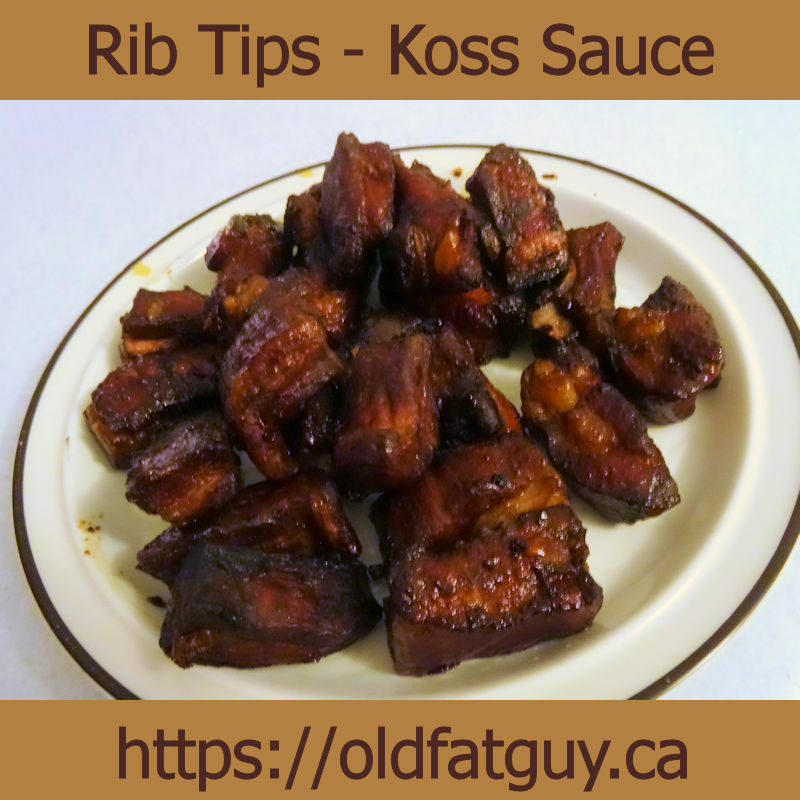 Brush the rib tips with Koss Sauce. Cook at 230 F for 30 minutes. Brush with Koss Sauce and cook for 30 minutes. If you let the ribs cool to room temperature, add 15 minutes to this cooking time.